The president has so many things going on to wear us out. It is so hard for us to keep up and I am willing to wager many things he is doing is nothing more than a distraction. There are many things we take for granted. So many things are engrained in our way of life, we do not consider them as rights but as standards of our way of life. We take for granted the right of free speech, religion, the right to own a gun, the right to have any seat we want on a bus or the right to live anywhere we want. Many men and women, black, white, Asian and native Americans have fought and died for the rights of us to live in a free society. Now, some members of congress and the candidate for the Supreme Court are willing to do what they can to retract some of these rights. 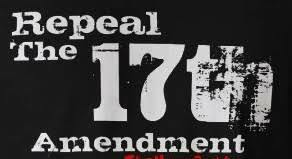 One of the rights under attack is the Seventeenth Amendment. Although less than two thirds of Americans voted in 2016, we also take for granted the right to vote for our elected officials. The 15th Amendment gives every American citizen the right to vote. The Seventeenth Amendment gives citizens of each state the right to vote for two senators. This Amendment was enacted in 1913 to put an end to corruption. Now, quietly, this amendment is under attack and we must wake up! When the Constitution was originally written, each state legislature elected its state’s senator for a six year term. This caused corruption within the state legislatures. The offices could be bought and sold to the highest bidder rather than the candidate to be picked based the ability of the candidate. State legislatures also faced deadlocks when it came to them having the ability to agree on the candidates. These deadlocks caused delays in the federal government getting things done. Lord knows we do not need any more delays. Just imagine if the state of Tennessee promoted Marcia Blackburn to the office without an election. This is a way to silence your voice and give power to the big corporations. The seventeenth amendment is an amendment I knew little about. There are reports that undermining this amendment will give power to single entities. Do not become too consumed with Russia, collusion and Stormy. These are all fascinating subjects but if we don’t pay attention, we will lose some of the rights we hold dear. History is a valuable asset. If you do not know your history, you are doomed to repeat it. We have an effective weapon to use and this is our right to vote. We must use this weapon in November and get as many people as possible woke and registered. The last day to register to vote for the November 6th election is October 9.